It’s not a new way to do research, which has a long and proud tradition of amateur involvement. The main thing that distinguishes today’s volunteer data envoys from their predecessors is the quality of the tools open to them, said Gabrys, an American researcher who is principal investigator on the ERC project ‘Citizen Sensing and Environmental Practice’ (CitizenSense). The standard kit of the crowd-sourced scientist is changing. The inventories, the binoculars, microscopes and checklists are being replaced by smartphones, which come complete with electronic sensors, digital cameras and interactive Web apps. “Devices are developing more awareness about their surroundings,” said Gabrys. The iPhone for example includes humidity detectors, as well as atmospheric pressure and temperature detectors. Such sensor-packed phones promise more efficient collection and dissemination of data. Throughout the study, Gabrys will test a whole range of environmental sensors. “There’s a lot of promises made about what these devices can do. We hope to test how accurate these things really are,” she said. Measurement quality is important and there may be reasons to be sceptical about it, said Gabrys, citing recent trouble faced by the manufacturers of the Fitbit heart rate monitoring Fitbit device, who are facing several lawsuits over claimed inaccuracies in data collecting. Within the scope of the ERC funding, Gabrys will develop three case studies that provide insights into the relationship between technologies and practices of environmental sensing and citizen engagement. The first case study, ‘Wild Sensing’ will focus on the use of sensors to map and track flora and fauna activity and habitats. 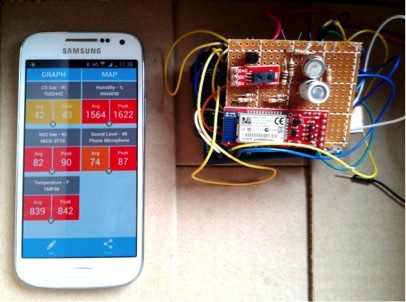 The second case study, ‘Pollution Sensing,’ will concentrate on the increasing use of sensors to detect air and water pollution. The third case study will investigate ‘Urban Sensing,’ and will focus on smart city projects that deploy sensor technologies to promote more efficient or environmentally-sound urban processes. Reporting gaps can compromise our understanding of environmental problems. In Beijing for example, a city often shrouded in a toxic haze, official environmental reporting is considered erratic, incomplete or untrustworthy. So citizens do it themselves, using backpacks, kites and smartphone apps, and a website of findings. quality data in real time. In Dublin, the website RateMyArea allows city residents to report and track problems, from broken streetlights to street crime. In cities in the US, citizens use The Water Reporter app to report local water pollution and other problems to local councillors. Amateur watchdogs are maintaining observation sites, uploading pictures, announcing events and debating online. They are contributing to open-source databases such as OpenStreetMap, a free and editable map of the world. Sensors give city residents leverage to improve their own environment, said Gabrys. This ranges from collecting evidence to influence noise management plans for airports or making cities safer for residents with poor health. Her ERC project also involves educating the public, and so for example she has led a walk through London to visit air quality monitoring stations to learn about harmful air particles and how they are monitored. “Overall, we have probably 100 interested participants. It’s not merely people who want to shut down industry. Certainly, there are some with strident agendas. But you have the moderate ones too like school teachers,” said Gabrys. Scientists always welcome the extra eyes. “Citizens are doing their own research and then contacting regulators to let them know about pollution in their areas,” she said.